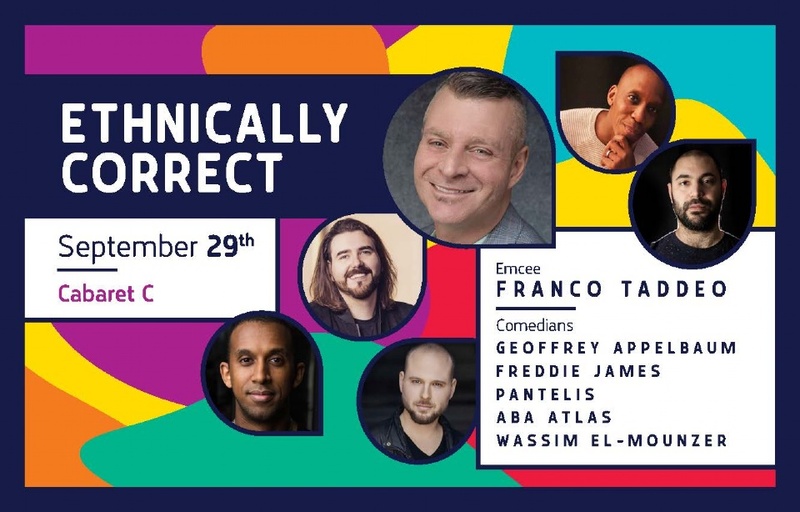 Festival Laval Laughs is the first comedy festival to take place in Laval and will be held from September 20th to 30th. 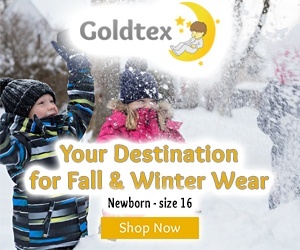 There will be something for everyone, from toddlers to seniors, which will bring people of all ages and cultures together. The goal: to create an annual comedy festival accessible to everyone. 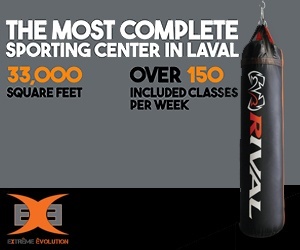 Festival Laval Laughs offers two components: an indoor component which will feature shows in various venues throughout Laval and an outdoor component which will provide free family entertainment at Centropolis. This family-friendly area will be accessible to everyone and is designed to please children, parents and seniors – the perfect place to relax, have fun, meet new people, eat great food and enjoy free entertainment in a festive family atmosphere. 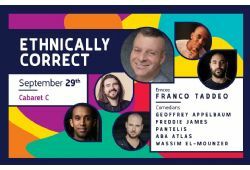 Talented, well-known English and French comedians will perform their comedic magic, so get ready to have a good laugh and a good time. Some of the talented performers include: Pauly Shore, Chantal Desjardins, Mario Jean, Eddy King, Freddie James, NEEV, Mélanie Couture, and so many more. There will also be a few surprise guest comedians for you to discover and enjoy (they can’t tell us everything!). 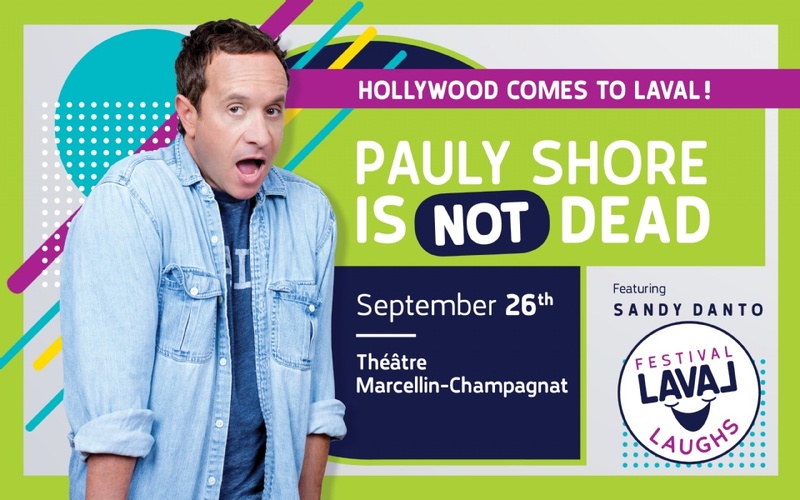 This fall, Shore will be touring Canada with a show called Pauly Shore Is Not Dead, a reference to his 2003 mockumentary, Pauly Shore Is Dead, in which the comedian pokes fun at his stance in Hollywood post 1990s. When asked what Canadians can expect to see from his show? “Well, they’re going to be thrilled that I’m not dead,” he jokes. In the years since his Hollywood film days, Shore has focused more intensely on stand-up comedy; an art he says allows him to present more of his own material rather than a persona. While he does practice a set for each show, Shore says he often goes off track and just has fun with the audience. He wants his show to be relatable and authentic, which is also why he tries to stay away from anything political. He just wants the audience to relate, laugh, and have a good time. Shore will be touring with up-and-coming comedian Sandy Danto. “I think he’s super talented, and at some point he’s really going to get the right opportunity and he’ll rise to the occasion,” he says. 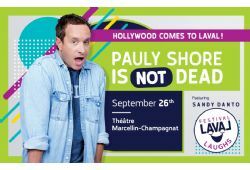 Shore is looking forward to being part of the Festival Laval Laughs this year – especially since he absolutely loves Canada! To keep up with Pauly Shore’s new shows, projects, and regular podcast, visit www.paulyshore.com. Desjardins grew up a tomboy and class clown in elementary and secondary school. She didn’t really watch sitcoms growing up, but discovered stand-up six years ago. At first her mother wasn’t crazy about her being a comedian, but now she is extremely proud and offers Desjardins suggestions for her acts. Desjardins first performed a sold out show at the Comedy Nest in 2010. She loved it and has never looked back. She is often the only female comic in a show, but that’s just fine with her. She gets along well with men and feels it’s advantageous to be the only woman in a show. Desjardins excels at many things and truly is a “Jill of all trades.” She has done voiceover commercials, been the sports anchor at CityTV and Sportsnet, anchored both Sports and Entertainment for CTV, and hosted the morning shows at CHOM, Virgin Radio, CJAD and CTV. Desjardins often travels with her boyfriend Harry (her biggest fan), around the world. Desjardins has done stand up at Gotham, New York and at Flappers in Los Angeles, plus many stints in Canada and the U.S. She says Seinfeld, Amy Schumer and Chelsea Handler are some of her favourite fellow comedians. She practices her material while pacing just before a show and practices her lines out loud on her cell phone (with no one on the other line!). She enjoys running, golf, softball and has travelled to more than 15 countries. She is currently learning how to play guitar. Desjardins is a huge sushi fan but also enjoys good Italian comfort food, Deluxe Kraft Dinner with mystery cheese in a squeeze bag and pierogis that remind her of her hometown in Winnipeg. Desjardins is extremely pleased and honoured to take part in Festival Laval Laughs. 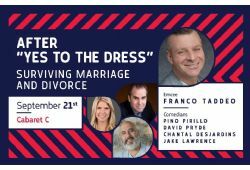 She will participate in three galas: After “Yes” to the Dress, Surviving Marriage and Divorce, So You Think You Can Joke? and You’re Prettier When You Smile. 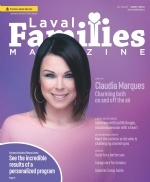 For info about Desjardins’ e-learning, audiobooks and comedy: Facebook: Chantal Desjardins, www.chantaldesjardins.ca, Twitter.com/ChantalOnAir. Pryde has been funny since he was a young student, but he was never considered a class clown. He says he preferred for others to get in trouble! Pryde received his Bachelor’s Degree in Journalism in Halifax, but discovered he didn’t really enjoy the field, so he attended acting workshops. He met someone who taught him five-minute stand-up. Then he won a contest for his comedic act at Dalhousie University and was awarded a pitcher of beer. He says he was hooked as soon as he saw the possibility of getting more free beer! Pryde continued to do bar shows in Halifax, then moved to Montreal, where there are more comedy clubs. His parents thought that he was “going through a phase,” but when they attended one of his shows, they understood and were extremely proud. Pryde gets his material from quietly observing language, common phrases and people. Pryde’s shows are mostly English, but he dabbles in French humour as well, which he says is more “theatrical”. He prefers performing live at comedy clubs, although he has also performed on TV and for radio. Pryde enjoys watching cartoons with family and bike rides. He likes swimming and says it “loosens his brain” to come up with funny ideas. Pryde is proudest of being nominated a couple of times as Best Male Stand-Up for the Canadian Comedy Awards. He was thrilled to participate in his first Just for Laughs competition early on in his career and actually had a 14-second debut on the Jay Leno Show where he told a single joke! Pryde’s favourite comedian is Derek Edwards, a Canadian comedian. He grew up watching comedians like Steve Martin and Monty Python’s Flying Circus. 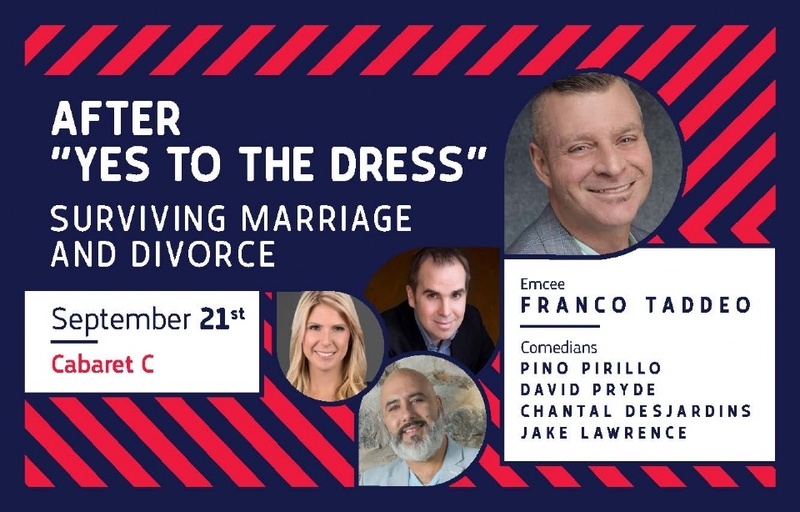 Pryde is pleased to be featured at the Festival Laval Laughs in After “Yes” to the Dress, Surviving Marriage and Divorce, which pokes fun at family and marriage. Pryde currently has three CDs out: Googly, Sight Gags and Tête Offensive, which can be downloaded on iTunes or purchased at www.davidpryde.com. King was born in France but his parents are originally from the Congo. In his teen years, he moved to Montreal, where he quickly discovered his passion for stand-up comedy. King performed in Kevin Hart’s Laugh Out Loud at Just for Laughs, and in 2016, he was the spokesperson for Mois de l’Histoire des Noirs à Montréal and at Festival Nuits d’Afrique in 2018. King uses material about his family and personal life for his jokes. He has always enjoyed watching live comedy shows and TV sitcoms. Among his favourites is The Fresh Prince of Belair. His first show was at Pub Jacques Cartier 11 years ago. That’s when he knew this was the right path for him. King has performed in Juste pour Rire, Le Grand Montréal Comédie Fest and ComediHa! in Québec City. King takes pleasure in boxing, martial arts, DJing, photography and time with his family. King currently lives in Laval and performs four times a week in various places in Montreal. He likes performing at Le Bordel Comédie Club. He performs in English and French, and writes his own material (which he usually thinks up in the shower). He is currently starring in a movie called La chute de l’empire américain, which was directed by Oscar-winning Director Denys Arcand. It’s a crime movie and King plays the villain. He is currently working on his second comedic one-man show Mokonzi, which will be out in 2019. JC stands for Jean-Christophe, though he prefers JC – without any dots or hyphens because he says it’s hipper. Surette grew up learning two languages in his native Moncton (Dieppe), New Brunswick home. He also speaks “Chiac” a combo of English/French, but doesn’t use it in his shows because no one would understand him (except in New Brunswick). 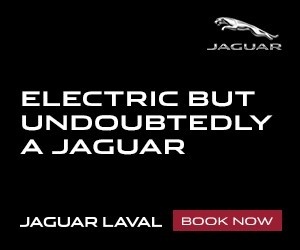 He performs in both English and French. Surette truly admired comic Mitch Hedberg and his unique one-liners. Female comedians he enjoys are Maude Landry and Virginie Fortin. Surette records every set and makes corrections to his timing as he practices. Sometimes he reinvents his lines, adding new ones as he goes. He believes that speaking is an art form and prefers his lines to be as natural as possible. Surette has opened for well-known comedian Mike Ward and is currently opening for Simon Gouache. “Both of them are amazing and I’ve learned a lot from them,” he says. Surette started his career at an English comedy club in Moncton. He now resides in Montreal. Surette picks up his material observing others and finding irony in things. Although he is a joker, there is a serious side to Surette, as well. He will tackle any subject to get laughs, but refrains from joking about illness or any sensitive topics. He says being nervous before a show is just excitement that shifts into positive energy and a vibration inside. Originally from Brampton, Ontario, Keesha Brownie has two brothers and a sister and her parents are originally from Jamaica. Brownie was shy as a child, but still considered a joker in class. “Lunch was my best class,” she says. She always gravitated towards comedy and has a group of friends who are all funny. Her parents are both witty, although her dad is more serious. Growing up, Brownie watched Alf, Love Boat and The Fresh Prince of Belair. She is a great fan of Jim Carey, Will Smith, Lenny Bruce, Dave Chappelle and Ellen Degeneres. Her first performance (making fun of teachers) was a comedy workshop at Humber College. She gets most of her material from her own life experiences, relationships and everyday observations. She writes her parodies and material while in the shower. Brownie is particularly proud of participating in Kevin Hart’s Just for Laughs Underground Comedy Railroad Tour and is one of the busiest female comedians in Canada. And yes, Keesha Brownie is her real name. “My name is the most delicious name in the game,” she says. Brownie is a true Capricorn as she is always trying to get to the top of the mountain. She says comedy is a Boys Club for the most part, but when she is the only female in the line-up, she provides uniqueness and a different voice. Her favourite musicians include The Beatles, Amy Winehouse and Lauren Hill. Brownie has performed in Scotland, Jamaica, Philadelphia, New York and Montreal (which she loves). She also produced a comedy series called Joker’s Corner, a bi-monthly show in Brampton, Ontario. Brownie is absolutely thrilled about performing her gala You’re Prettier When You Smile for Laval Laughs. www.gotbrownie.com, Twitter.com/KeeshaBrownie, Facebook: Comedia Keesha Brownie, or Instagram @keeshabrownie. Quinn will appear in The Newbies Show and You’re Prettier When You Smile. 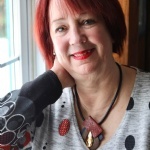 She is honoured to be part of Festival Laval Laughs. Twitter.com/doctorquinn. If you and your family enjoy sharing a good laugh, head out to the Festival Laval Laughs. You need to purchase tickets for indoor shows (hurry before they are sold out!). For more info, see www.festivallavallaughs.ca, Facebook: Festival Laval en Rires or call 450-981-0364.